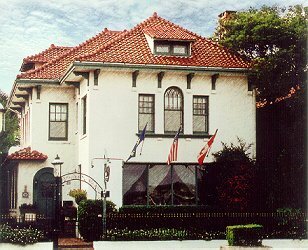 In keeping with the Flagler era, Casa de la Paz graces St. Augustine's bayfront and historic district with it's elegant Mediterranean architecture. Central to all sites, fine restaurants, shopping and miles of ocean beaches. Each of our six guest rooms are distinctive in style and furnishings reminiscent of the early 1900's era. All have a queen or king bed, cable TV, phone and private bath. From your room or veranda enjoy views of passing boats on Matanzas Bay or our beautiful walled Spanish garden courtyard. Awake to the fragrant aromas of a freshly baked breakfast and our own specially blended coffee. Our delicious full breakfast typically includes a savory quiche, muffins or cakes, fresh fruit and homemade apple butter. We invite you to be our guests and while in St. Augustine make Casa de la Paz your home. USAir -- "One of Florida's 10 best Bed & Breakfast's"
This and other St Augustine Bed and Breakfast Inns can be found here in The Register. Romantic Country Inns, Getaways and B&Bs offer a great Saint Augustine lodging alternative to big hotels.